Following a year of tensions between their country and the United States, Pakistanis continue to hold highly unfavorable views of the U.S. and offer bleak assessments of the relationship between the two nations. Roughly three-in-four Pakistanis (74%) consider the U.S. an enemy, up from 69% last year and 64% three years ago. And President Obama is held in exceedingly low regard. Indeed, among the 15 nations surveyed in both 2008 and 2012 by the Pew Global Attitudes Project, Pakistan is the only country where ratings for Obama are no better than the ratings President George W. Bush received during his final year in office (for more, see “Global Opinion of Obama Slips, International Policies Faulted,” released June 13, 2012). Only 13% of Pakistanis think relations with the U.S. have improved in recent years, down 16 percentage points from 2011. Strengthening the bilateral relationship is also becoming less of a priority for Pakistanis. While 45% still say it is important to improve relations with the U.S., this is down from 60% last year. Moreover, roughly four-in-ten believe that American economic and military aid is actually having a negative impact on their country, while only about one-in-ten think the impact is positive. Additionally, over the last few years, Pakistanis have become less willing to work with the U.S. on efforts to combat extremist groups. While 50% still want the U.S. to provide financial and humanitarian aid to areas where extremists operate, this is down from 72% in 2009. 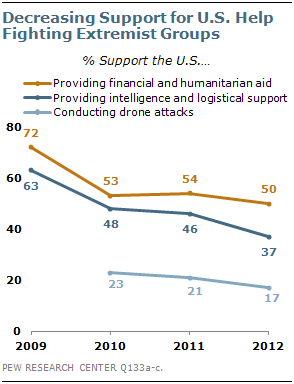 Similarly, fewer Pakistanis now want intelligence and logistical support from the U.S. than they did three years ago. And only 17% back American drone strikes against leaders of extremist groups, even if they are conducted in conjunction with the Pakistani government. 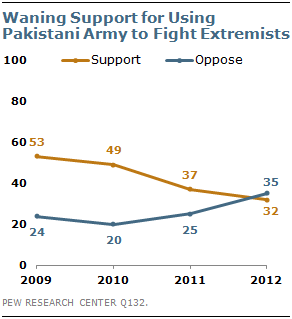 Since 2009, the Pakistani public has also become less willing to use its own military to combat extremist groups. Three years ago, 53% favored using the army to fight extremists in the Federally Administered Tribal Areas (FATA) and neighboring Khyber Pakhtunkhwa, but today just 32% hold this view. Overall, concerns about extremism have ebbed since 2009, when the Pakistan military was battling Taliban-affiliated groups in the Swat Valley area near Islamabad. Then, fully 69% were concerned that extremists might take control of Pakistan, compared with 52% today. While concerns about extremism may have decreased, extremist organizations remain largely unpopular. Majorities, for example, express a negative opinion of both al Qaeda and the Taliban, as has been the case since 2009. In 2008 – before the peak of the Swat Valley conflict – pluralities expressed no opinion about these organizations. When Pakistanis are asked more specifically about the Afghan Taliban and Tehrik-i-Taliban (also known as the TTP or Pakistan Taliban), opinions are again, on balance, negative, as they were in both 2010 and 2011. Views are somewhat more mixed, however, regarding Lashkar-e-Taiba, a radical group active in Kashmir and widely blamed for the 2008 Mumbai terrorist attacks. Roughly one-in-five Pakistanis (22%) have a favorable view of Lashkar-e-Taiba, while 37% give it a negative rating and 41% offer no opinion. Meanwhile, a solid majority (64%) offers no opinion about the Haqqani network, a group associated with the Taliban that is active on both sides of the Pakistan-Afghanistan border, but is largely believed to be based in the FATA region of Pakistan. Respondents in the Khyber Pakhtunkhwa province consistently express more negative views about extremist groups than those in other provinces. Al Qaeda, the Taliban, Tehrik-i-Taliban, the Afghan Taliban and Lashkar-e-Taiba all receive especially poor ratings in Khyber Pakhtunkhwa. Pakistanis who pray five times per day are also more likely than those who pray less often to offer negative views of extremist groups. These are among the key findings from a survey of Pakistan by the Pew Research Center’s Global Attitudes Project. Face-to-face interviews were conducted with 1,206 respondents between March 28 and April 13. The sample covers approximately 82% of the Pakistani population.1 The poll in Pakistan is part of the larger 21-nation spring 2012 Pew Global Attitudes survey. Throughout the report, unless otherwise noted, trends from 2011 refer to a survey conducted in Pakistan from May 8-15, 2011, following the May 2, 2011 U.S. military raid that killed Osama bin Laden.2 The May 2011 survey showed that, with a few exceptions, the killing of bin Laden had little impact on America’s already low ratings in Pakistan. The current poll reveals that, in some key areas, Pakistani views of the relationship between the two countries have become even more negative in the year since the Abbottabad raid. Pakistanis continue to express considerable discontent with conditions in their own country. About nine-in-ten (87%) are dissatisfied with the country’s direction, barely changed from last year’s 92%. Similarly, 89% describe the national economic situation as bad; 85% held this view in 2011. And overwhelming majorities rate unemployment, crime, terrorism, and corruption as very big problems. The dismal public mood is reflected in poor ratings for the leaders of the incumbent Pakistan People’s Party (PPP), President Asif Ali Zardari and former Prime Minister Yousaf Raza Gilani. 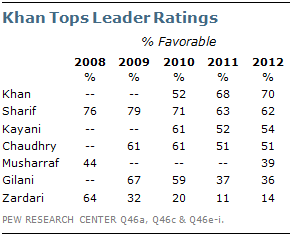 Only 14% view Zardari favorably, little changed from last year, but down significantly from 64% in 2008. Gilani, who was recently convicted of contempt and dismissed from office by Pakistan’s highest court, fares only somewhat better, at 36% favorable. Gilani received similarly poor ratings last year, although as recently as 2010 a majority of Pakistanis expressed a favorable view of him. The most popular leader included on the survey is Imran Khan. Seven-in-ten Pakistanis offer a favorable opinion of the former cricket star and leader of the Pakistani Tehreek-e-Insaf party (PTI). This is essentially unchanged from last year, but up significantly from 2010. Former Prime Minister Nawaz Sharif is also generally well-regarded – about six-in-ten offer a positive view of the leader of the country’s main opposition party, the Pakistan Muslim League-Nawaz (PML-N). Sharif has consistently received high marks in recent years, although his ratings are down somewhat from the 79% registered in 2009. Slightly more than half rate Chief of Army Staff General Ashfaq Parvez Kayani and Chief Justice Iftikhar Muhammad Chaudhry favorably. Ratings for both the army chief and the chief justice have slipped slightly since 2010. Former President (and military chief) Pervez Musharraf, who has occasionally suggested he may return to Pakistani politics, receives relatively poor ratings. Meanwhile, the military continues to receive overwhelmingly positive marks from the Pakistani public – 77% say the institution is having a good influence on the country. Roughly six-in-ten (58%) also say this about the court system. Only 22% of Pakistanis have a favorable view of traditional rival India, although this is actually a slight improvement from 14% last year. 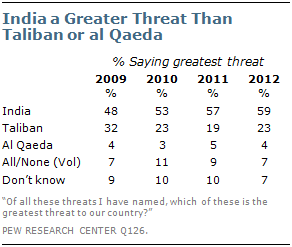 Moreover, when asked which is the biggest threat to their country, India, the Taliban, or al Qaeda, 59% name India. Pakistanis have consistently identified India as the top threat since the question was first asked in 2009. The percentage fearing India has increased by 11 points since then, while the percentage naming the Taliban has decreased by nine points. Despite these negative sentiments, 62% of Pakistanis say it is important to improve relations with India. And roughly two-thirds support more bilateral trade and further talks to try to reduce tensions between the two nations. Most Indians also want better relations, more trade, and further talks between the two nations. Still, Indian attitudes toward Pakistan remain largely negative. Roughly six-in-ten Indians (59%) express an unfavorable opinion of Pakistan, although this is down slightly from 65% in 2011. India is not the only country, however, where negative views of Pakistan prevail. Majorities or pluralities give Pakistan a negative rating in six of the seven other countries where this question was asked, including China, Japan, and three predominantly Muslim nations – Egypt, Jordan and Tunisia. A 43%-plurality of Pakistanis expect the economy to get worse over the next 12 months, while just 26% think it will improve. Still, there is more optimism than in 2011, when 60% said the country’s economic situation would worsen in the coming year. China continues to receive high marks in Pakistan. Nine-in-ten Pakistanis consider China a partner; only 2% say it is more of an enemy. Pakistanis and Indians agree that Kashmir should be a priority for their countries. Roughly eight-in-ten Pakistanis and about six-in-ten Indians say it is very important to resolve the dispute over Kashmir. Those who identify with Imran Khan’s Tehreek-e-Insaf party are especially likely to oppose American involvement in the battle against extremist groups in Pakistan, including American aid to areas where extremists operate and intelligence and logistical support to the Pakistani army.